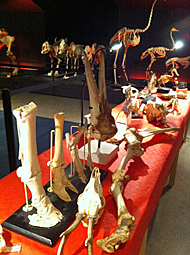 The Museum of Evolution arranges special activities during school holidays. Other recurring events are Geology Day and Culture Night. Most of our activities are suitable for children between 6 and 10 years old accompanied by adults. For the fifth year in a row the Museum of Evolution and Gustavianum open up their collection archives. During the day there will be behind-the-scenes tours (booking required, info@em.uu.se) and family activities. The Museum of Evolution will be open for the public as usual, and this day without an entrance fee. Dinosaur exhibition and dino crafts. Saturday 8 September at 18-22. Free admittance. Walk among the dinosaurs in the dark. Bring your own torch.